Radium Fuel Rail Kits are CNC machined from solid 6061 aluminum and black dipped anodized for a high quality surface finish. It is compatible with all fuel types including popular alcohol mixtures such as E85. 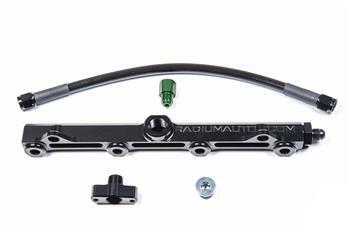 The Radium fuel rail is the first and only on the market to support an (optional) fuel pulsation damper. The opening and closing of the injectors creates pressure pulses in the fuel rail, which can lead to unstable fuel pressure. In order to achieve a safe and consistent rail pressure, a pulse damper should be used (especially with high flow injectors). The internal diaphragm will absorb oscillation pulses and stabilize fuel pressure. This correction can be measured throughout the RPM range and can often help an erratic surging idle.